Our facilities are user friendly and comprehensive. The indoor arena at Kersbrook Equestrian Centre is well surfaced, dust-free and airy. It’s under the same roof as our stables and has direct access to the show jumping arena. It’s overlooked at one end by audience seating and the Training Room, allowing spectators and classes to view the arena for educational purposes if desired. A PA system is also available for hire. The show jumping arena at Kersbrook Equestrian Centre is a floodlit and measures 80m x 40m. 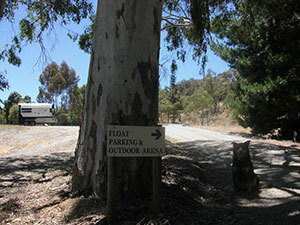 A large gum tree near the centre of the arena offers shade and makes an attractive feature. It sits behind the indoor arena and its proximity to the stables and other facilities makes it extremely convenient to use. Kersbrook Equestrian Centre also has a 20m x 60m outdoor arena overlooking our largest dam. It’s conveniently located near the main parking area. Kersbrook Equestrian Centre offers extensive modern stabling facilities adjoining the indoor arena under the roof of our main building. Each of the 12 stables offers spacious, safe and comfortable accommodation for your horse. We also have a warm water wash bay. For your convenience, the kitchen and toilet facilities are also in the stable block. With windows overlooking the indoor arena, the training room provides the ideal location to study and hold seminars. It’s fitted with a whiteboard as well as student chairs and ample power outlets. As part of the main equestrian centre building, the lecture room is also handy to the kitchen and stables.